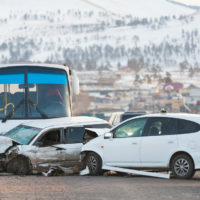 In a recent case before the New York Appellate Division, the judges were asked to decide whether a bus accident victim’s injuries met New York’s serious injury threshold, enabling the claim to move forward to trial. The case is an example of issues often faced by New York plaintiffs in lawsuits based on motor vehicle accidents. The case of Lindo v. Brett stemmed from a collision between a car and a MTA Bus Company bus. Andy Lindo, the driver of the car, filed a lawsuit against the bus company and bus driver based on injuries he received to his spine, shoulder, and knee. The defendants, after subjecting Lindo to an examination by their own physicians, tried to dismiss Lindo’s claims, arguing that the claims were not permitted under New York’s no-fault laws. The state’s Insurance Law provides for several conditions under which an injury will be deemed serious, including injuries which cause permanent and consequential limitation of a body member or organ. These injuries must have been caused by the accident and not by pre-existing conditions or prior injuries. If an injury caused by an accident does not meet the law’s definition of “serious,” and the plaintiff hasn’t suffered $50,000 in economic losses, then the victim will be required to rely on insurance to cover the costs of the injuries. Lindo argued that his injuries to his spine, knee, and shoulder were permanent. However, the doctors hired by the defendants disagreed. One doctor found that the victim’s spinal range of motion was not limited, but did not examine his knee or shoulder. The other doctor, after examining the results of MRIs conducted on Lindo’s back and joints, found no evidence of tears or traumatic damage, and believed that the victim’s spinal injuries were the result of degenerative disc disease rather than the traffic accident. Lindo’s doctors provided testimony that Lindo did not have any pre-existing history of spinal issues, that Lindo was partially disabled, and that he would likely have lifelong difficulties relating to his injuries. While the trial court dismissed Lindo’s claims for failing to meet the serious injury threshold, the Appellate Division disagreed. In order to dismiss a claim before trial through a motion for summary judgment, a defendant must show that there is no significant factual issue still in dispute based on evidence that has been presented already. The Appellate Division noted that, since the plaintiff had presented credible evidence from multiple doctors that he was partially disabled and would face health issues for the rest of his life based on his injuries from the accident, the plaintiff had a right to go to trial on his claims. If you’ve been seriously injured in a New York car accident, find out if you have a claim for money damages by contacting the dedicated and knowledgeable Hudson Valley personal injury lawyers at Rusk, Wadlin, Heppner & Martuscello, LLP for a consultation, in Kingston at 845-331-4100, or in Marlboro at 845-236-4411.